Reprint List Adherence: Do We Really Need an App for That? A new survey by Envision Solutions, LLC, a healthcare marketing communications company, suggests that many Americans are deeply skeptical of pharmaceutical companies’ motives for supporting non-profit patient advocacy groups. Are Some DTC Print Ads Too Educational and/or Persuasive? Recently, two FDA studies were in the news: “Disease Information in Branded Promotional Material” and “Effect of Promotional Offers in Direct-to-Consumer Prescription Drug Print Advertisements on Consumer Product Perceptions.” The focus of both these studies will be on print ads. This article reviews how tailored behavior change programs can increase acquisition, compliance, persistency or brand loyalty. A smoking cessation program is presented as a case study. In 2005, sales of biotech products — i.e., biologics, including therapeutic serums, toxins, antitoxins, vaccines, blood components or derivatives, allergenic products, or analogous products, or derivatives — grew by 17.1 percent, far outstripping the 5.2 percent in sales growth of small molecules-products developed and marketed by Big Pharma. Although the overall total sales of biologics is still small in comparison to small molecules — about $52 billion vs. $600 billion — the biotech industry is poised to dramatically increase the number of products it adds to the market each year. Whatever the numbers, there’s blood in the water and ad agencies are circling, trying to entice these innovative companies into transforming themselves into marketing machines. Some agency people suggest that biotech needs to engage in traditional direct-to-consumer (DTC) advertising. Biotech, however, needs more than DTC as usual. Definitions and FAQs: What is a biological product? How do biological products differ from conventional drugs? This article explores the trend in direct-to-consumer (DTC) ads for ‘breakthrough’ cancer therapies. For various reasons, it is hard to find a conclusively documented answer to a seemingly simple question: do interactive health education media improve patients’ health practices? In fact, a recent high-profile report attempted to answer that question and got it wrong: procedural flaws led them to an unjustified conclusion. This article describes recent dark and ominous “disease awareness” ads, the goal of which is to instill fear in the viewing public and motivate them to see the doctor. Do TV DTC Ads Overstate Rx Drug Risks? With all the new attention being paid to drug risks, it is time to take a look at the issues surrounding drug risk communication to consumers and patients. Pharmaceutical marketers need to understand these issues to better communicate risk and build trust in their brands. This article presents a case for the drug industry to adopt a patient-centric model in which pharma companies can develop unique expertise in decoding the behavior, needs, motivations of empowered patients and then use this knowledge as the basis for helping healthcare professionals and payers to put into place programs that achieve better patient outcomes. Pharmaceutical advertising was historically directed toward health care professionals and mainly communicated through medical journals. Rigorous research is needed to evaluate and determine the most effective format for communicating benefit and risk information to consumers. New standards for drug advertising to consumers should be grounded in data derived from this type of research.. Patients also need more effective counseling about their medications. In an effort to make drug package inserts easier to read and understand — and perhaps to save money on printing costs — the FDA is planning to test single-page consumer information sheets that would replace the multi-page package inserts and medication guides widely used in retail pharmacies. However ‘dumbed down’ the label gets, it is still important that physicians and pharmacists take a more pro-active role in educating consumers about the drugs they are taking. NPs, PAs, and even RNs are for the most part overlooked by the pharmaceutical industry, according to David Mittman, PA, president of Clinician 1. 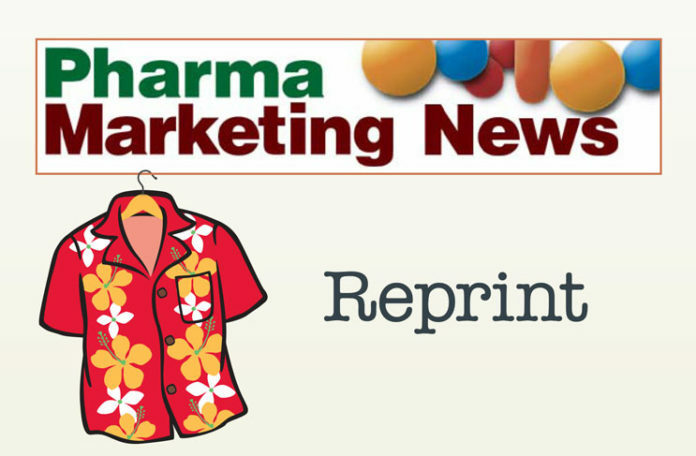 This article reviews the issue and includes tips for marketing to NPs and PAs. Innerstate is a disease awareness full-length documentary film produced by Centocor. This review is based on a private screening. Both the financial and social implications of non-compliance were the subjects of the recent 7th Annual Forum on Patient Compliance, Adherence and Persistency. This article presents highlights and case studies from this forum.. Unless you are living under a rock on the Moon, you’ve probably heard that Novo Nordisk has teamed up with celebrity Southern-style chef Paula Deen as a paid spokesperson. Ambre Morley, Associate Director, Product Communications, Novo Nordisk, answers questions about why her company teamed up with Deen as a diabetes spokesperson. Should Pharma Disclose Payments to Celebrity Spokespeople? Pharma marketers in the U.S. sometimes use celebrities as spokespeople for their branded drugs or for non-branded campaigns. Such celebrities include TV personalities, athletes, movie stars and others who have thousands or millions of fans, Twitter followers, etc. Should Pharma Disclose Payments to Celebrity Spokespeople? This is just one of the issues explored in a recent survey of Pharma Marketing News readers. In a recent report, the IMS Institute for Healthcare Informatics noted that Wikipedia articles on health issues are “in flux” and that there is a need for “knowledgeable editors” to keep the information as current and unbiased as possible. Should the pharmaceutical industry or agents of the industry step up and edit content on Wikipedia? This article discusses both the right and wrongs ways for pharma to do this using real-life examples. This article describes a new health awareness initiative intended to reach African Americans via churches and health ministries in an effort to alert this community to their heightened risk for life-threatening conditions such as high blood pressure, diabetes and much more. “Break a Leg,” But Avoid Pratfalls! If you have questions about the ‘dos & don’ts’ and ‘pros & cons’ of using medical and non-medical mouthpieces for pharma PR and DTC advertising, this article provides some answers and opinions based on interviews of experts with years of experience in this area.